Puffs of colored powder erupt into the sky and descend upon the gathered crowds. 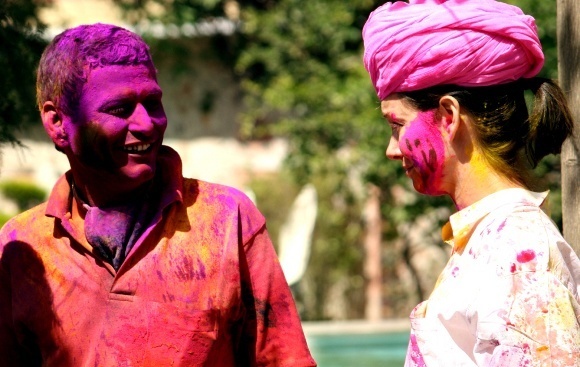 As the first flowers bloom, the fun-filled spring festival of Holi in India is an incredibly entertaining and unmissable celebration during your India vacations. Regal Rajasthan in North India is your cultural catalyst for delving into the rich Hindu mythology and traditions in March. Known as the festival of colors, Holi is ablaze in legends. The most notable is of the demon King Hiranyakashyap, who was angry that his son Prahlad worshipped Lord Vishnu, and so he commanded Prahlad’s sister, Holika, who could resist the flames, to take him into a burning fire. Whilst Prahlad was protected due to his extreme devotion of Vishnu, Holika was burnt to ashes as she begged forgiveness. Prahlad vowed to remember her once a year and, as a triumph of good over evil, Holi celebrations commence with the lighting of giant bonfires across India. Another legend revolves around the immortal love of Krishna and Radha. Troubled with his dark skin compared to his beau’s fair complexion, Krishna applied color onto his lover’s face to see how she would change. This is one explanation for the ritual of friends playing “Holi” where colorful dyes in powder form and fragrant water are smeared on each other’s faces. With laughter filling the streets, Holi is a full moon day festival for all and provides the opportunity to forget any of the routine woes, with flirting and playing pranks just part of the uninhibited fun. Discover a riot of color during your India vacations through this event, which is to be enjoyed by participants and spectators alike! Aside from throwing color, people visit each other’s homes and fresh sweets are distributed. Spectacular street processions with folk songs and dances take place in various regions across India. 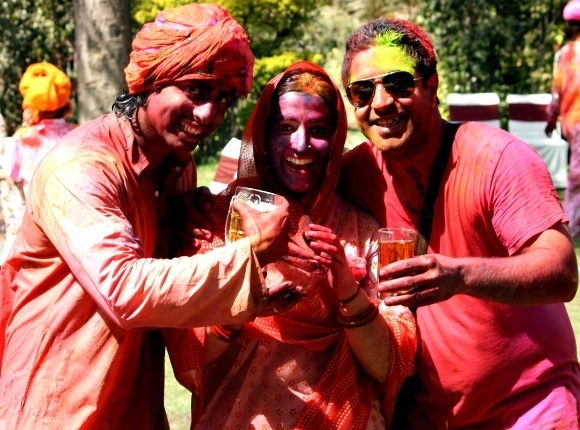 While planning India vacations, don’t forget that the pink city of Jaipur in Rajasthan is possibly the most exciting city to be in during the Holi celebrations, as a great festival occurs over three days. The Elephant festival in Jaipur is an accolade to the regal pageants of the Rajputs who treated elephants with great respect as much during royal festivities as during battle. Today’s elephant festival provides an opportunity to witness a ceremonial procession in the historic tradition, with camels, horses and chariots, cannons and palanquins, not to mention majestic elephants ornately painted and attired in embroidered velvets. Enchanting Travels Top Tip: Discover our personally selected tried and tested Jaipur hotel collection for your stay during Holi. With less fanfare, you’ll also find Holi being played in the local villages, which is an altogether different experience for observing the festivities. 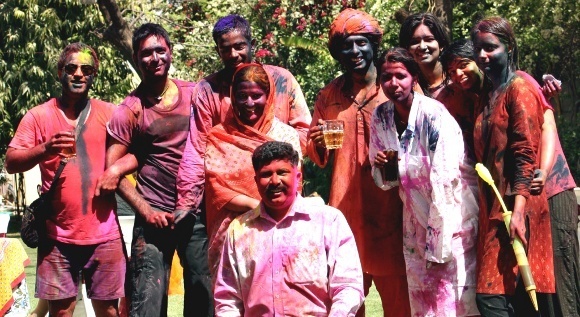 Holi will be celebrated in Wednesday, March 23, 2016. Sport a turban, wear your play clothes and be enchanted by dazzling colors of spring! Click here to plan your private, custom tour of Rajasthan.